Fishing in Mosquito Lagoon is famous for trophy redfish and speckled trout. 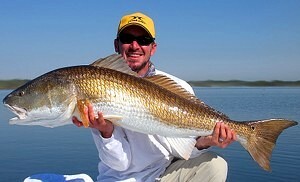 Redfish over 20 pounds are world class and many spend the entire year in the Lagoon waters. Every month is good in Mosquito Lagoon when fishing for redfish. Fishing Mosquito Lagoon during the winter and spring equals crystal clear water and there will be many schools of redfish to sight fish. During the summer and fall, trophy bull redfish are in spawning groups in deeper water. Fishing Mosquito Lagoon for trophy size trout over 5 pounds is possible year round. 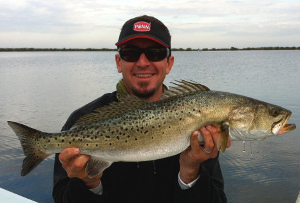 While there is always a chance to catch a giant speckled trout over 10lbs in the Mosquito Lagoon, April through June is the best time of year. Fishing Mosquito Lagoon for speckled trout occurs on shallow grass flats, bars, islands, and oyster creeks. Capt. Lemmon runs Mosquito Lagoon fishing charters for people of all ages and ability using light tackle live bait, lures and fly fishing. Besides redfish and speckled trout, you also will fish for snook, tarpon, black drum throughout the Mosquito Lagoon. You can stay up to date by reading Capt. Lemmon’s latest Mosquito Lagoon Fishing Reports. Capt. Lemmon does New Smyrna Beach fishing charters in the creeks around New Smyrna Beach and Ponce Inlet as well as nearshore along the beaches. You will be fishing around New Smyrna Beach for tarpon, snook, speckled trout, jack crevalle, flounder, and sharks. New Smyrna Beach fishing for Tarpon occurs during spring, summer and fall, while adult fish over 80 pounds move in around Ponce Inlet during the summer and early fall. With appropriate weather, Capt. Lemmon also fishes for tarpon in the ocean along New Smyrna Beach. Daytona Beach and New Smyrna Beach have good fishing for Snook, speckled trout and flounder around area docks, seawalls and bridges. Fishing for them in New Smyrna and Daytona Beach is best during the fall, winter and spring months. Capt. Lemmon has New Smyrna Beach fishing charters and Daytona Beach fishing charters for people of all ages and skill level using light tackle fishing with live bait, lures, and flies. At the end of the day, Capt. Lemmon will be happy to send your photos from New Smyrna Beach area fishing trips by email or text. Indian River Lagoon fishing is popular for trophy redfish, black drum, spotted sea trout, snook and tarpon. The Indian River Lagoon stretches 150 miles. Schools of trophy size Indian River redfish are caught fishing the deeper flats in the northern half of the Lagoon. During the late summer these schools combine forming massive spawning groups in the deeper basins and ICW of the Indian River. When fishing Redfish in the Indian River Lagoon, fish up to 50lbs are not out of the question. Fishing in the Indian River Lagoon is also great for trophy Spotted Sea Trout. The world record speckled trout over 17 pounds, as well as many other line class records have been caught fishing in the Indian River Lagoon. Snook and Tarpon are commonly caught when fishing Indian River Lagoon’s central and southern zones. Capt. Lemmon offers Indian River Lagoon fishing charters year round to people of all ages and skill ability using live bait, lures, and flies.